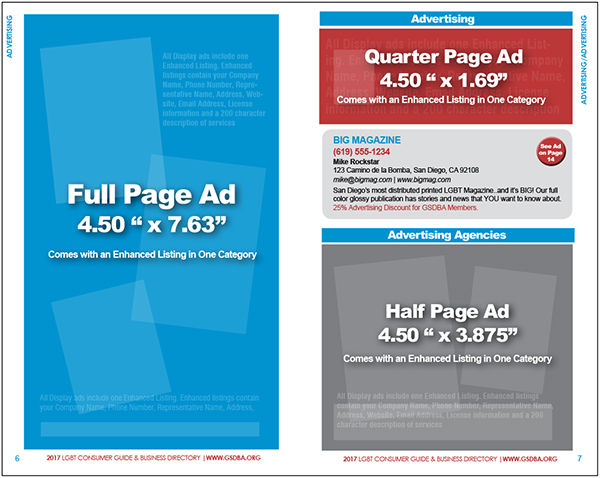 Resolution: Ads submitted as images, and images within PDFs must be at least 300 dpi. Color: All color artwork and placed images must be CMYK. No RGB images will be accepted. Images and ads in black and white should be converted to CMYK. File Format: Ad files must be in flattened .PDF, TIFF, or JPEG format. All files must be created to the specified ad size (see dimensions below). You do not need to include crop marks. No bleeds are necessary. All ads must use the CMYK working space. Fonts: All text should be converted to outlines or fonts embedded in your PDF document; Note: Excessively small fonts (below 6 pt) may not register. Ads should be designed full size with no crop marks or bleeds necessary. A pt (.5) outline is suggested. Should be designed as two (2) full page ads with border on 3 sides. Please specify right and left placement on file names.